Amazing! 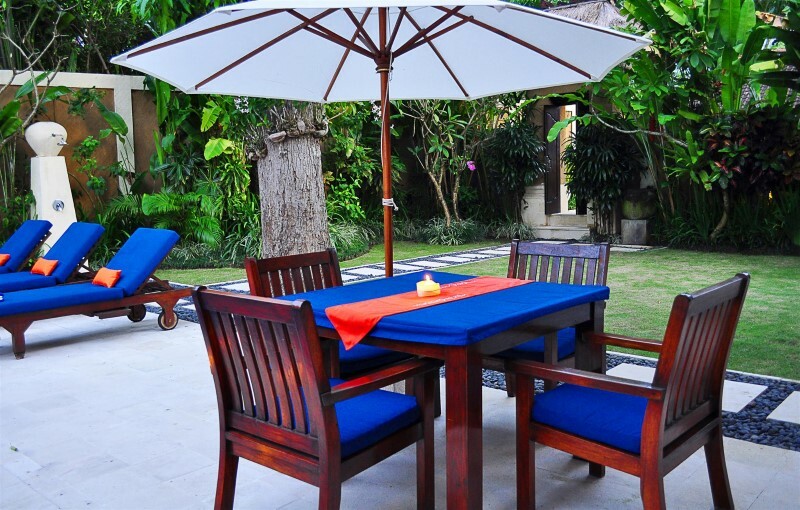 Villa Sayang was in great condition, the staff were lovely and very helpful. Close to the beach as well as shops and restaurants. Couldn’t have asked for more! Good service, very prompt in fixing breakdowns, able to solve transport issues on spot. 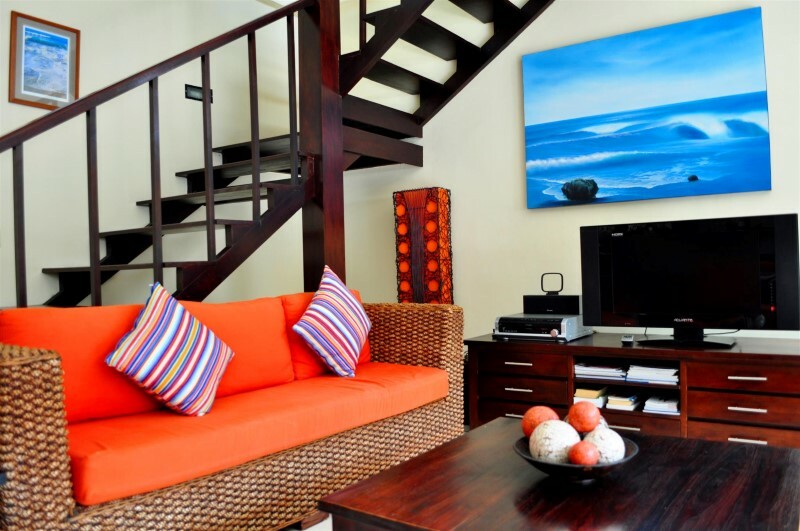 Our stay was extremely enjoyable, our Vila was spotless and clean and stunning. komang and Kadek were endlessly helpful and really made our holiday special. thanks to the team villa Bugis for a great holiday. 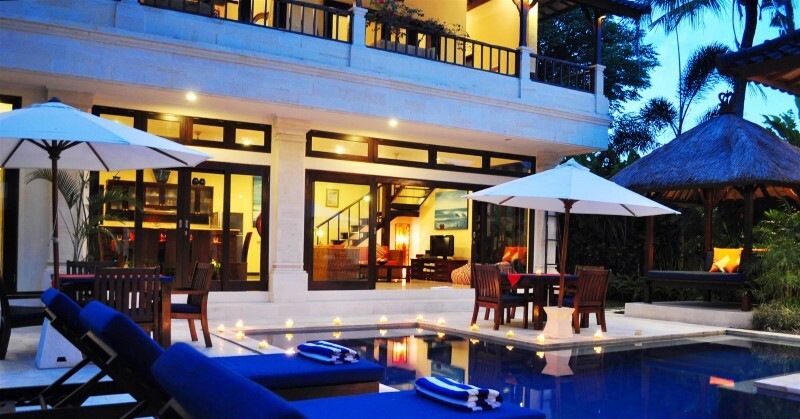 Villa Sayang is a 4 bedroom villa Seminyak. Sayang is an Indonesian word meaning “love with care” and just as the name implies the villa depicts the love and caring affection the owners have towards the environment and the Balinese culture and its people. 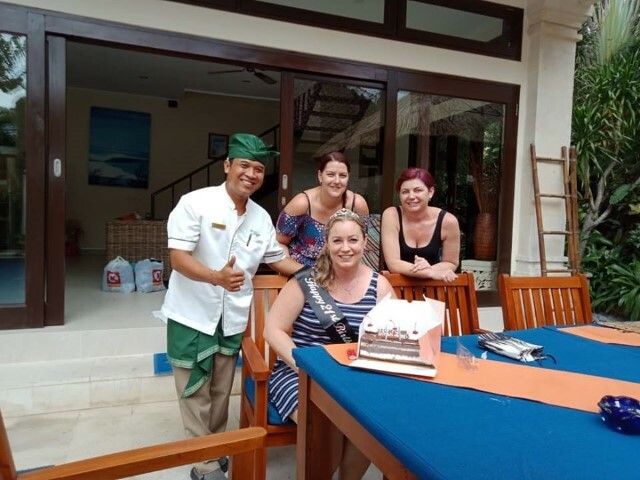 As soon as you enter Villa Sayang you will certainly feel the care and attention given by the friendly, smiling staff. 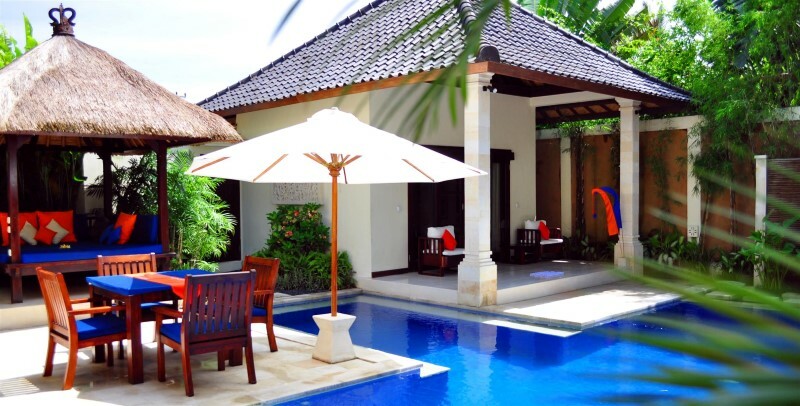 Villa Sayang has been designed to recreate the ambience of a traditional Balinese compound featuring separate structures scattered across a landscaped garden. 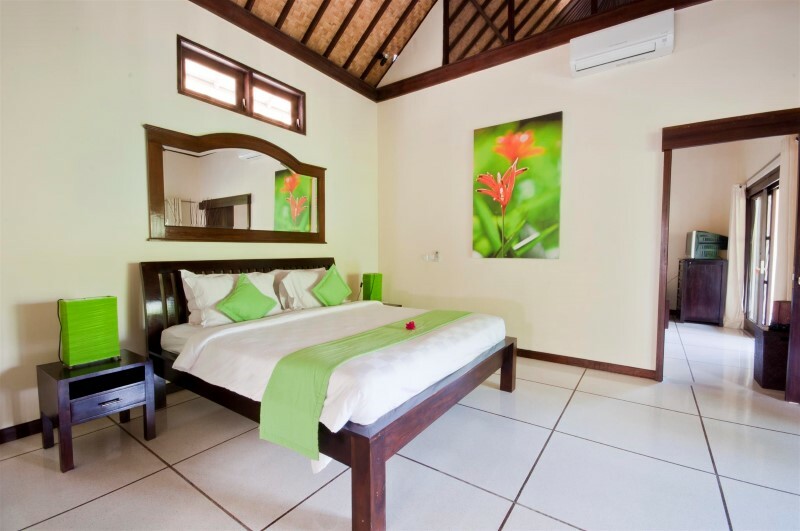 The Villa is a wonderful introduction to a tropical lifestyle experience and is a perfect choice for a family trip or group of friends. There are two independent structures, with a nice T shaped swimming pool in the middle of the property. The two-storey house contains the living and dining area, TV room, and three bedrooms. The living and dining areas are protected by sliding doors making it comfortable for adults at night and safe for children. It includes a large flat screen TV, DVD and CD player as well as I-pod dock. Music is played through speakers throughout the downstairs living area and out into the gazebo. The inside dining space is located beside the kitchen and living space. This area makes it possible for the guests to enjoy a quiet elegant candlelight meal while listening to music or watching television or a movie. There are two outside dining areas for poolside dining. The kitchen area is located on the first floor and in the corner of living room. 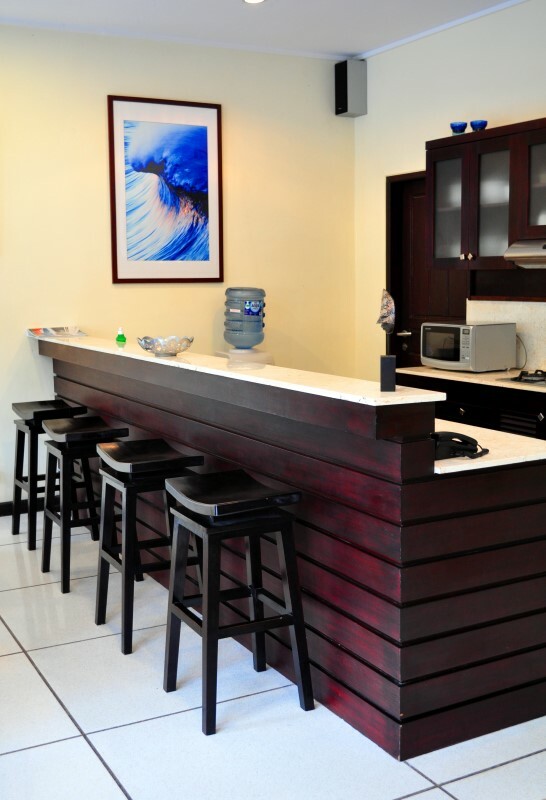 The kitchen comes complete with gas stove, microwave, coffee maker, juicer, cutlery, crockery, glassware and maxi bar. An aqua water machine provides hot and cold water at all times. The other structures are a guesthouse a gazebo and BBQ area. 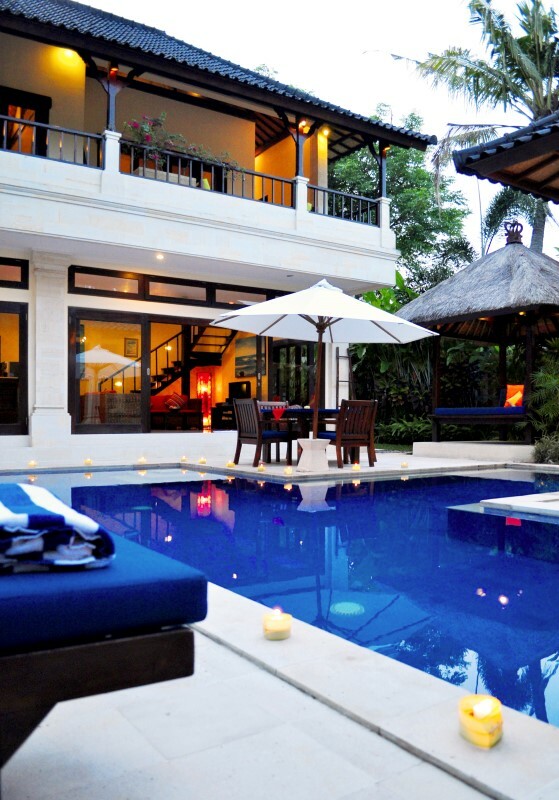 All parts of the villa overlook the beautiful bright blue swimming pool. The master bedroom is located on the upper level and it includes a king sized bed, air conditioning, safety deposit box, a walk in dressing area, bath tub with beautiful natural outdoor shower, large flat screen TV and DVD player. The Master bedroom opens out onto a large balcony with daybed just right for an afternoon sleep! Connecting to the master bedroom is a children’s room including 2 king sized single beds, TV and DVD player opening onto a large balcony with table and chairs for afternoon reading. 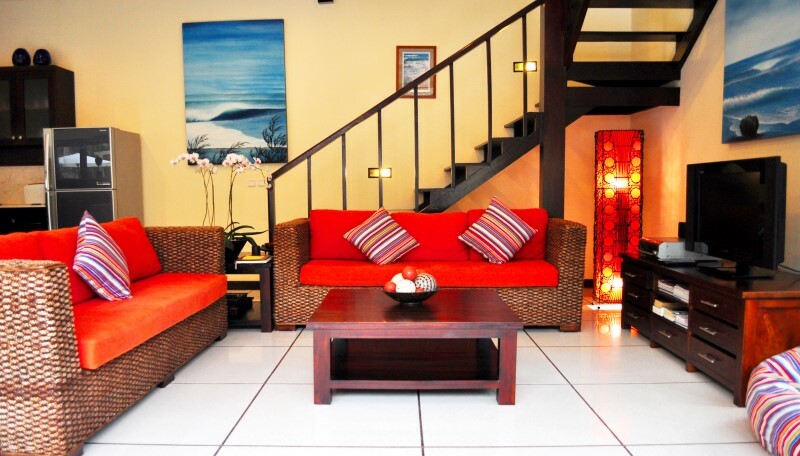 There is a separate charming guesthouse overlooking the swimming pool, water feature and landscaped gardens. It includes a queen sized bed, TV and safety deposit box, a bathroom dressing room and a lovely garden shower. The guesthouse also opens onto its own balcony area where you can relax beside the pool with direct access to the pool for a refreshing swim. 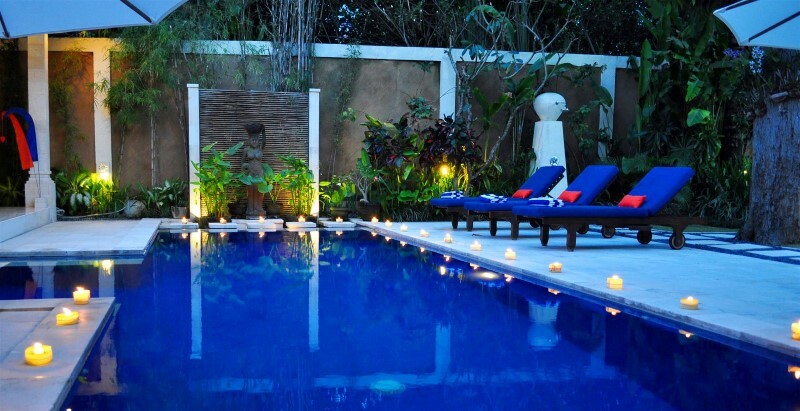 The grounds of the villa are dominated by a bright blue swimming pool, which is surrounded by a tropical garden filled with flowers and including a water feature which provides the peaceful sound of water to lull you to sleep. 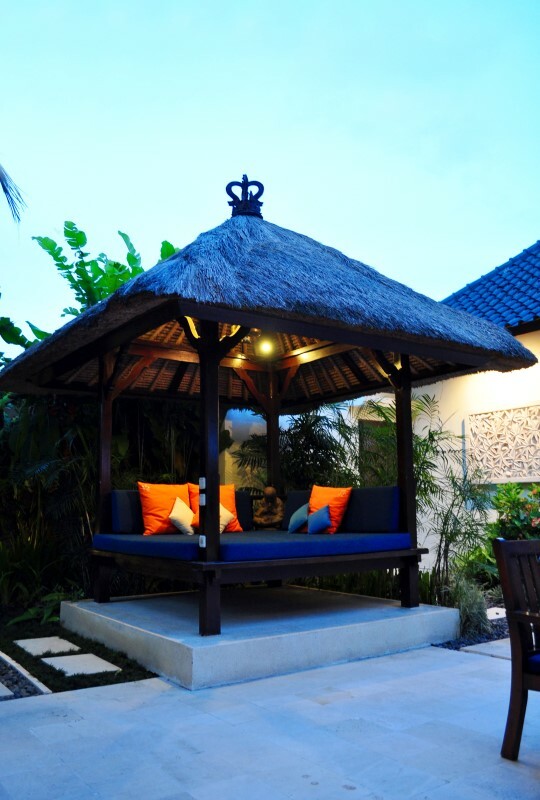 Beside the garden and close to the main house is a gazebo with a daybed, pillows, fan and music just perfect for reading, sleeping a massage or a game. The grounds also include a BBQ area, three sofa lounges and umbrellas and a large lawn all of which will make your holiday unforgettable and filled with wonderful memories. 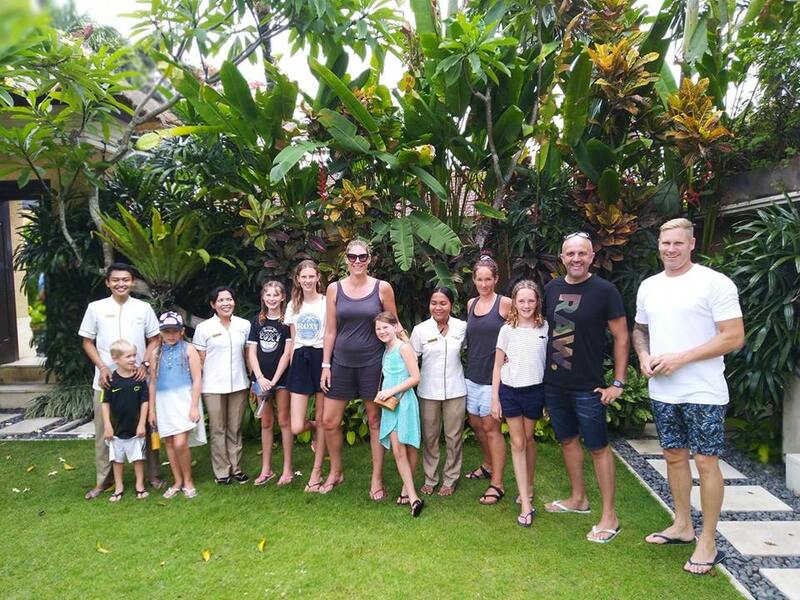 We had three villas in total for an extended family holiday and Wedding.The staff were wonderful, couldn’t do enough to make our stay enjoyable. From the security men to the house staff, cleaners and gardeners everyone was so friendly and helpful. We had a fantastic time at villa Sayang! 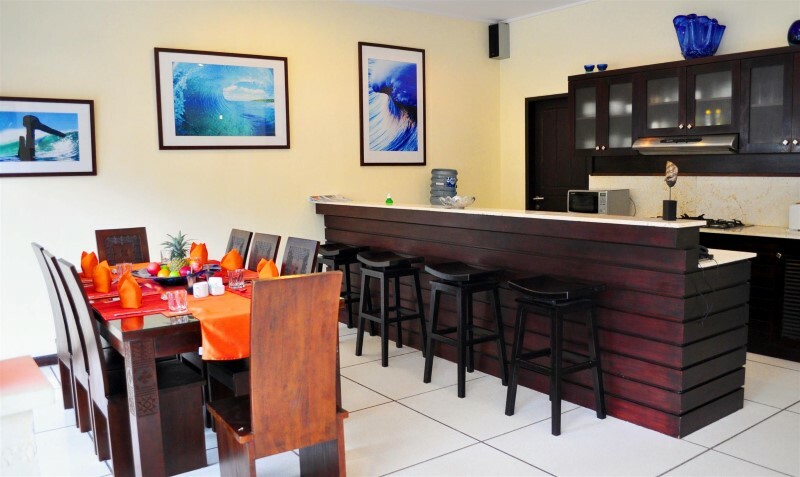 The location is great, near the beach and close to restaurants and shops. The staff was tremendous, helpful in all matters and nice! It was safe and felt really in peace at this wonderful villa! 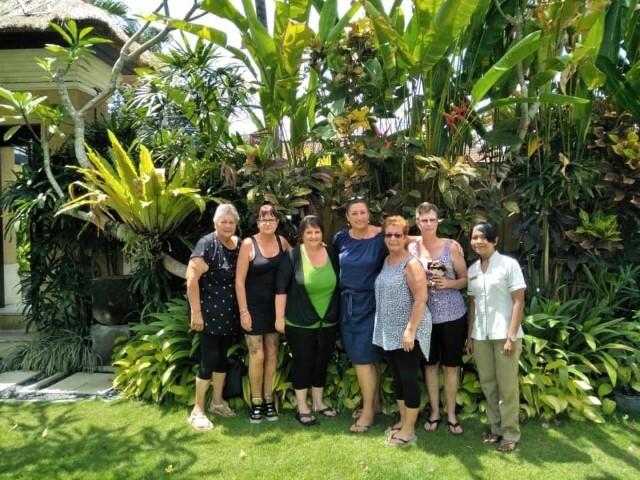 Our group has just returned from our second stay with Villa Bugis. This year we stayed in Villa Sayang which was just lovely. 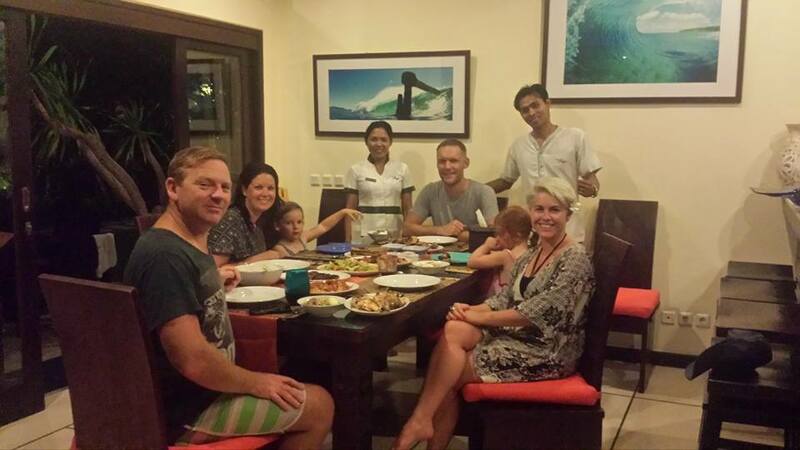 All the staff are very friendly from the airport driver, security staff to our villa staff – especially Brata and Ana. 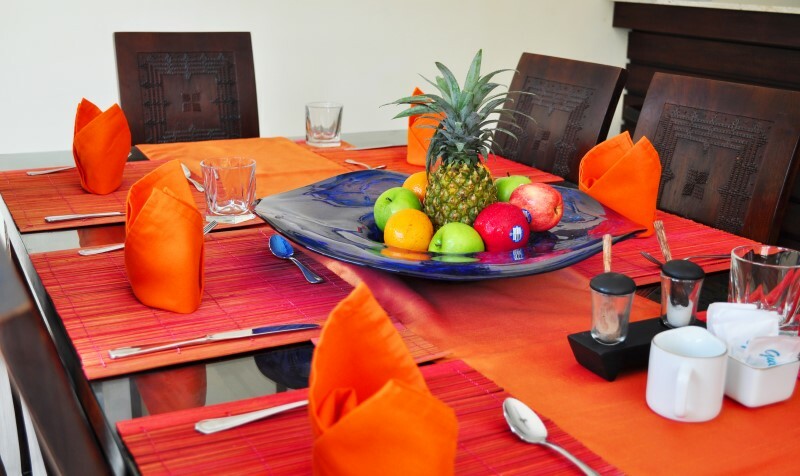 We would highly recommend the in villa dining – just wonderful!!! 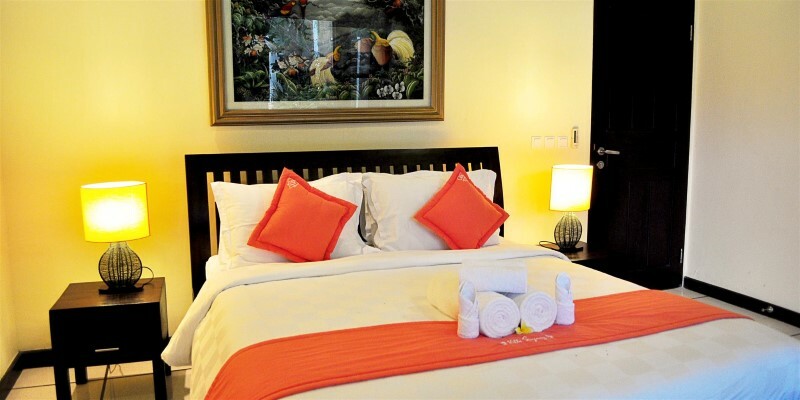 The location of the Villa is excellent – close to the beach, Bintang Supermarket and the restaurants and shops of Camplung Tanduk. 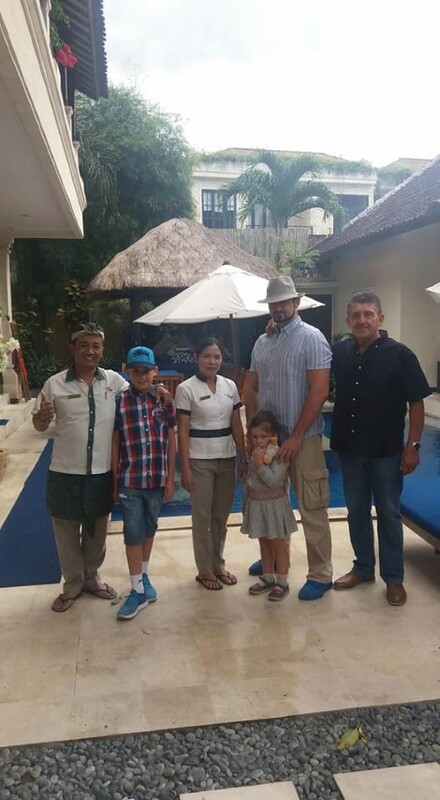 A big thank you to Gede, Made, Brata, Ana and all the Villa Bugis staff for making our holiday very special. We are looking forward to seeing you all again soon. Have just returned from an amazing holiday with the girls in Bali! Villa Sayang was outstanding. The staff were so helpful and friendly. Anything you needed they would sort out straight away. 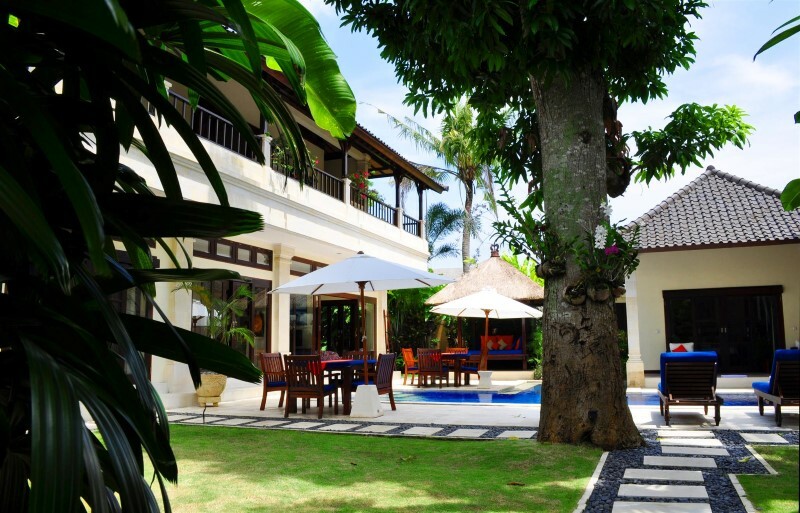 The villa is in a great location not far from the Bintang supermarket. I would highly recommend Villa Sayang. 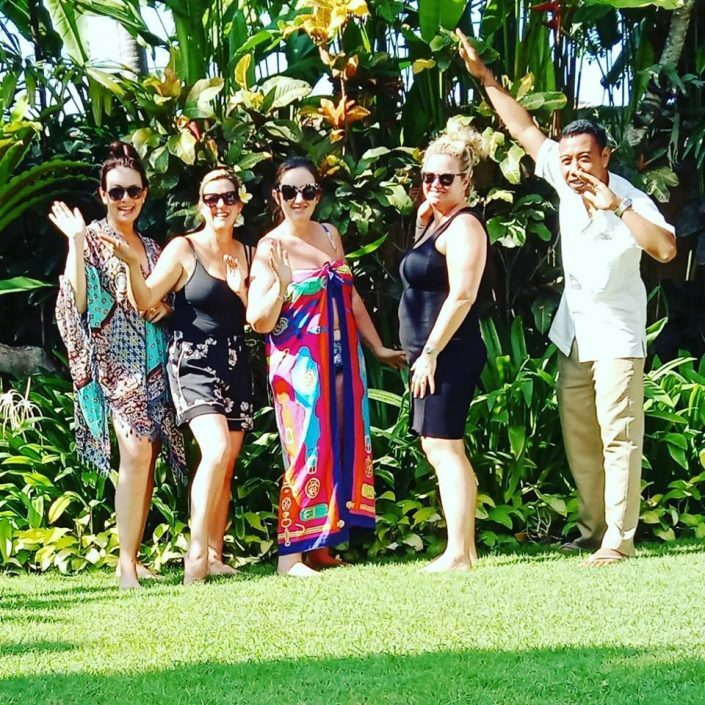 I stayed at Villa Sayang for a week and I had an amazing time. 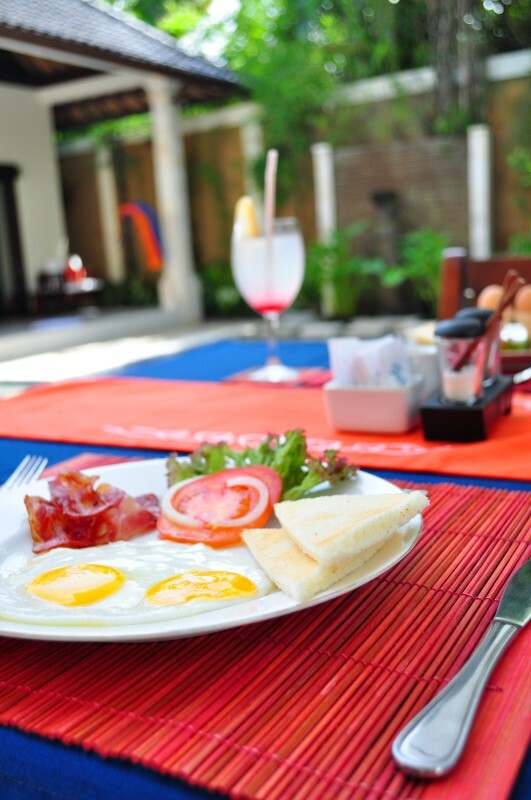 The staff prepared an amazing daily breakfast to our specifications. It was delicious everyday. We also requested one of their BBQ option and the entire meal was delicious. The grounds, pool and rooms were cleaned daily. No need to bring your own bug spray they provide some in each room, but you can if you prefer. The staff were helpful and friendly. A couple of times the water went out, but it was immediately rectified. Nonetheless, a lizard made its way into my room and scared the living day light out of me. But overall, it was an awesome stay! 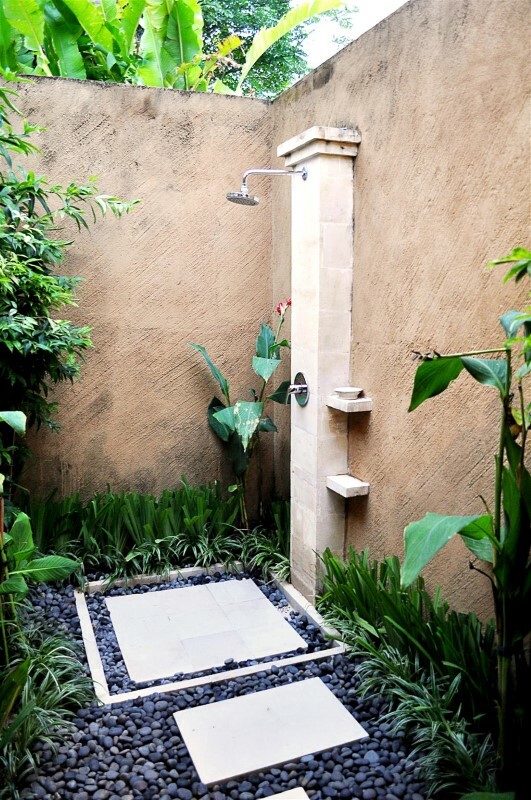 This was our second time staying at a Villa Bugis property, and once again it was great. 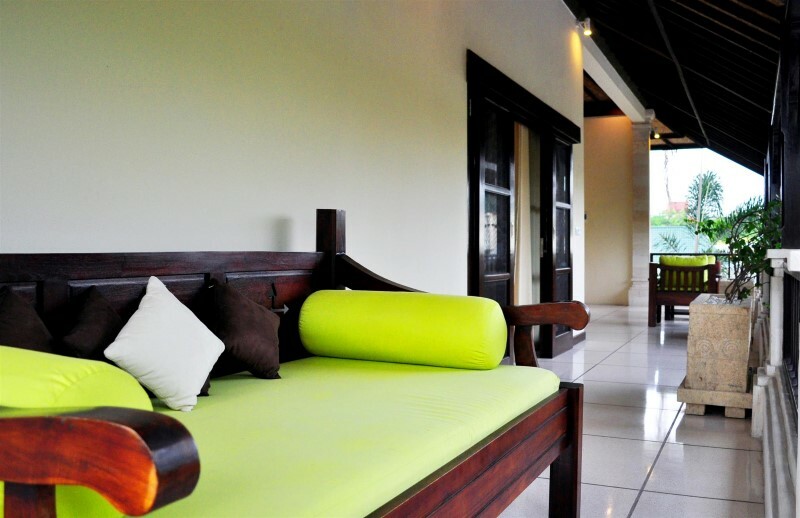 Villa Sayang has a wonderful location and the layout is perfect for families traveling together. We like being close to the beach and near shops and restaurants. 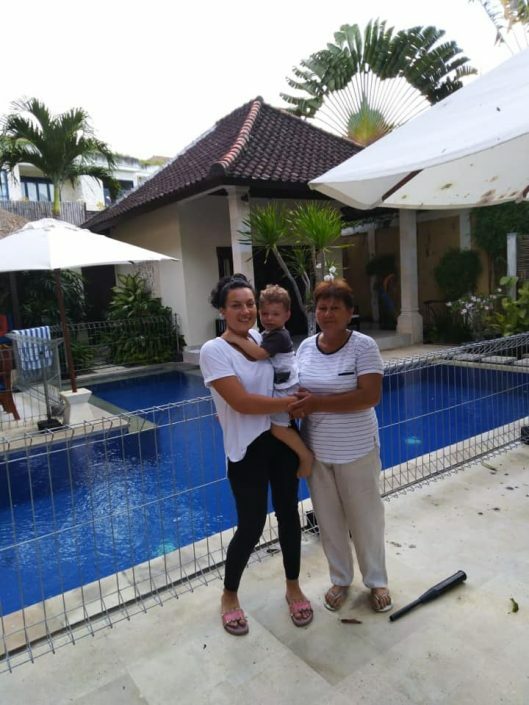 The property is not as big as the one at Villa Kebun (where we stayed last year), meaning that the pool wasn’t huge. It’s not a big issue, but if you have a lot of older kids the pool could be a little small. 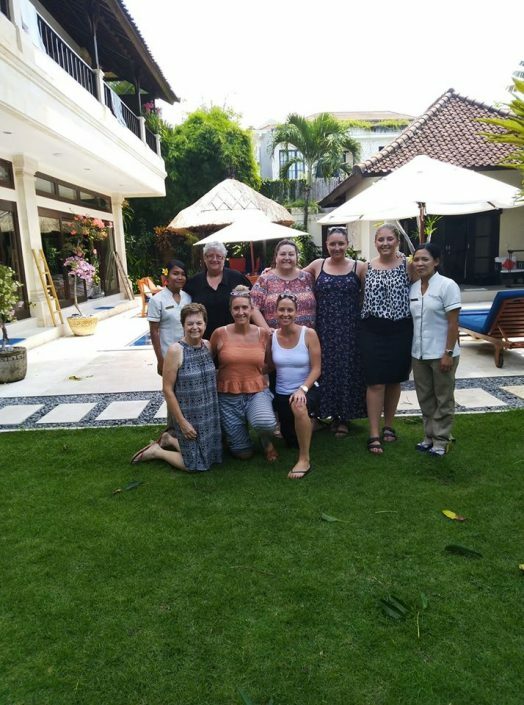 As was the case the previous year, the staff at all the Villa Bugis properties is indispensable and amazing. From arranging transportation to babysitting and cooking great breakfasts, they exceeded every expectation. 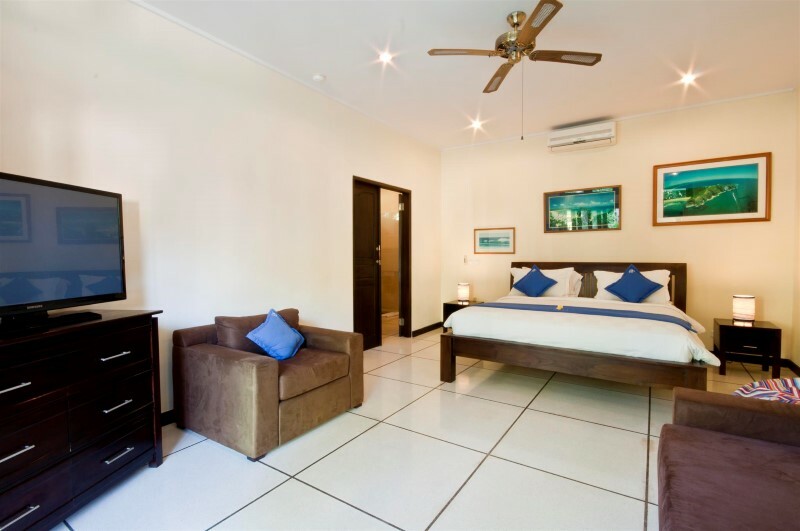 We wouldn’t hesitate to recommend any Villa Bugis property and would definitely stay at one again. We absolutely loved our stay here. Best location with both beach (with all its restaurants -LaPlancha a favourite), and supermarket and money changers just a short walk away. A few minutes further to Seminyak Square, markets, trendy little boutiques, great cafes, eateries and the best of the ‘Yak, basically. When all that got to be too much we adored the pool and garden gazebo-a great start and finish to every day actually. We meeting Ana, Made and the team. Her genuine smile and service made us all (4 adults, 3 children) feel so at home. Thankyou so much! We can’t wait to come back ? 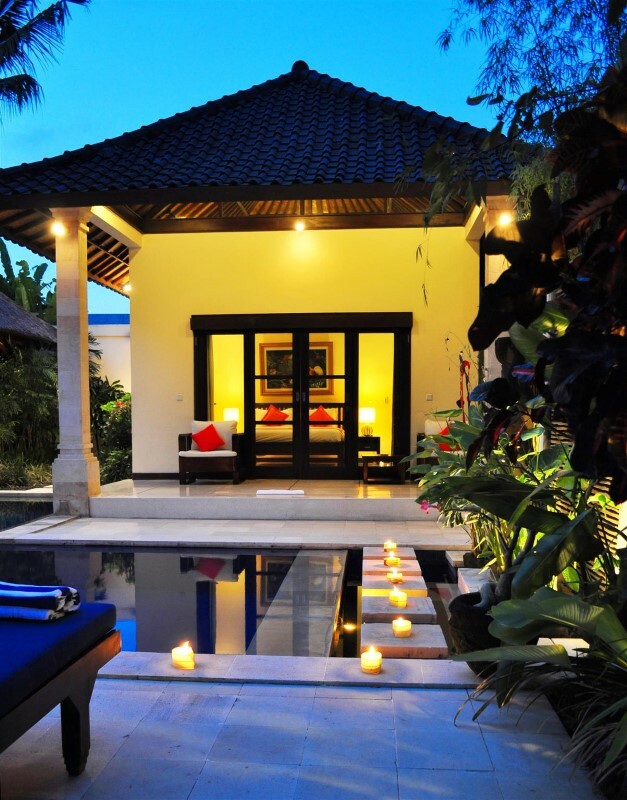 Just returned from my favourite villa in Seminyak- Villa Sayang was my favourite, is still my favourite. 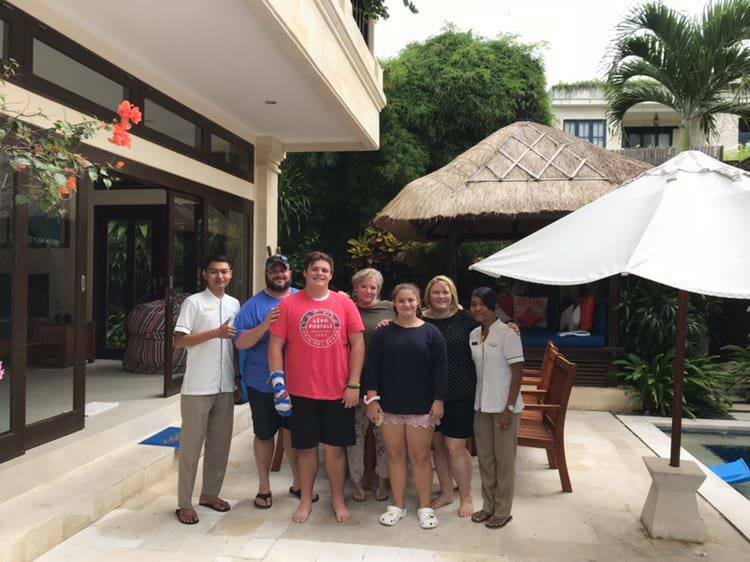 We had opportunity to move around to several other villas during this trip, and must say that other villas did not compare in quality nor experience. For us, bigger or more open accommodation is not necessarily better, and we appreciated the ability to close the glass sliding doors from the elements if needed (as seen in the villa pictures). And once again, Villa Sayang is the perfect spot for a quick walk onto the beach down the quiet laneway- no need to make a trek for the beach- another fact we truly appreciated after staying elsewhere… an easy stroll for sunset cocktails or beers and nuts… And one more thing that’s welcome after comparing with other villas- fast reliable internet access, sometimes you need it more than other times! Also, cannot say thanks enough to the lovely Villa Sayang staff, always smiling and friendly, and helpful if one needs help. Gorgeous villa, perfect location, gorgeous people, let’s go again soon! Here we were back at our favourite villa for location and quality. Holidaying for 8 days and had 9 extra. THANK GOODNESS WE COULD STAY ON AT SAYANG for 4 extra nights then this company relocated us to another villa for 3 nights and then another for 2 nights. The company was amazing and I’ve really had a good look at other villas now. VILLA SAYANG is the best for previously stated, location to beach, shopping and restaurants BUT I love their sliding glass doors to close kitchen off at night. NO ANIMALS can enter and the roof is tiled so NO WET SMELL. The WIFI IS FAST and always ACCESSIBLE, everything is so well presented. 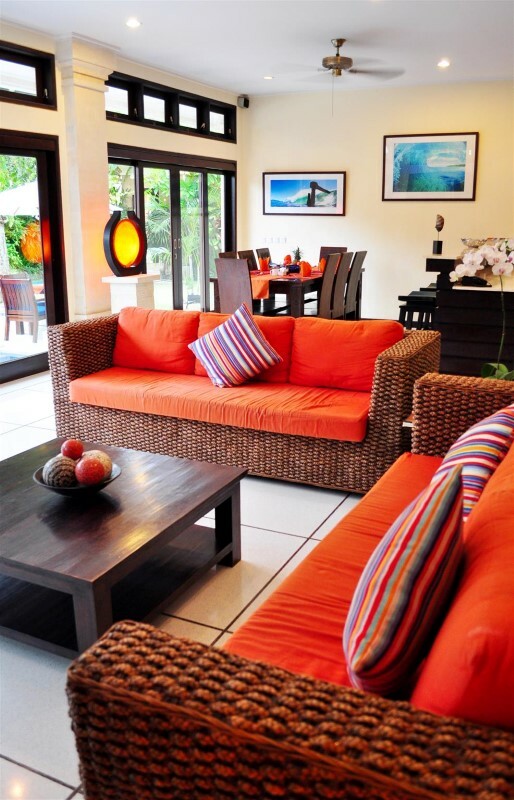 Its a first class position and a perfectly maintained Villa and you won’t find better. We will return. 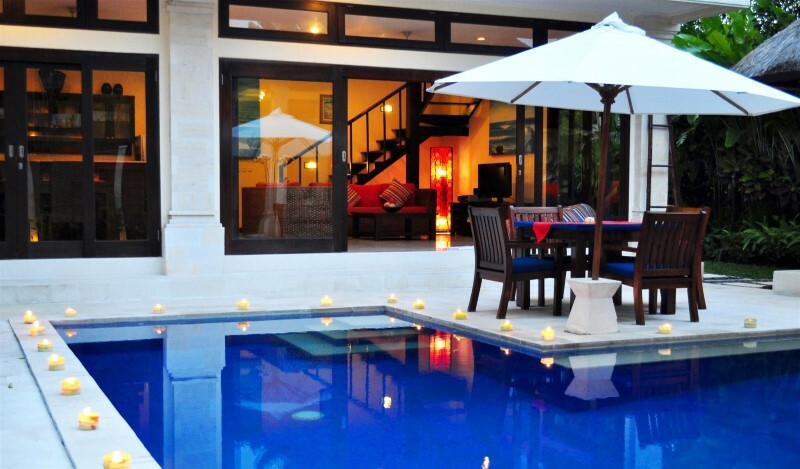 Villa Sayang is beautiful accommodation offering everything that a holiday maker needs. The building is well designed around a pool with very comfortable bedrooms and well appointed amenities.A big plus is the enclosed eating , cooking and lounge area….large doors can be opened up during the day and closed at night. This gives the guest the ability to close out any little animal visitors. The villa is ideally located within walking distance to the beach, supermarket, a myriad of shops, restaurants and importantly the day spa. 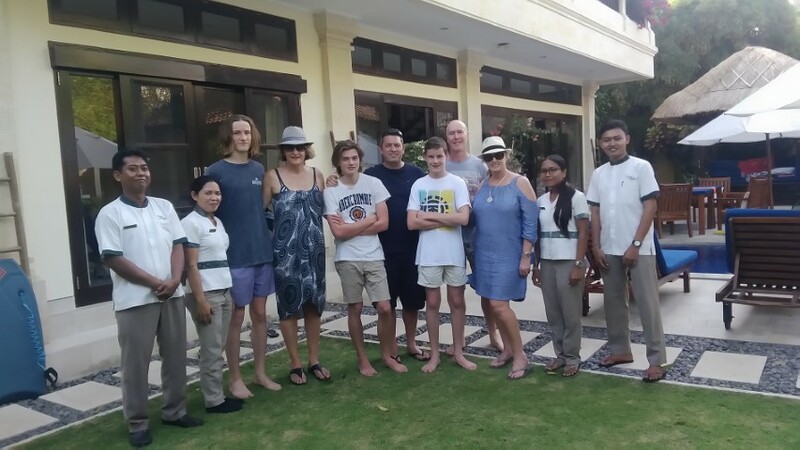 The staff are welcoming and pay great attention to and take pride in the daily housekeeping, garden maintenance and seciurity making this a very relaxing and safe place to stay. This is our 2nd time staying with the Bugis Villa group. The first stay at villa Sayang. The Villa is exactly like the website photos depicted. It’s location is fabulous, tucked away down a quiet lane. 3 minute stroll to the beach and 6 minutes along a quiet laneway to the supermarket. A great place to stay and have peace and tranquillity, nothing to hear except the birds and the fountain. The bedrooms are very spacious and well presented. The whole villa has lovely homey touches throughout, you really can believe you live here. 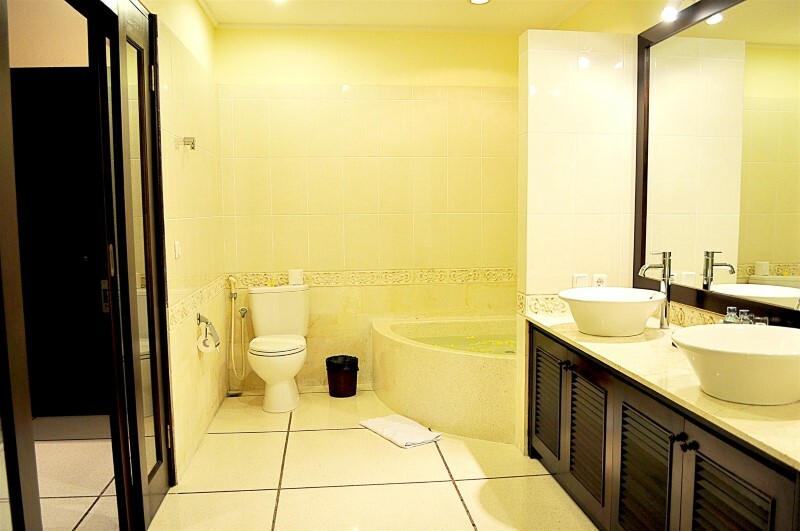 The staff at Bugis Villas are always so accommodating and friendly, nothing is ever a bother. We even had a look through some of the vacant villas for future trips. A MUST stay. Would definitely recommend and will definitely be back. Thanks to everyone for a great trip. Love, Love, Love, this Villa. Everything about this villa is fantastic. The villa in reality is much better than the photo’s on the web page. Very well maintained with gorgeous pool & lovely serene garden. The villa is realy big, much bigger than I thought, huge rooms, lovely big kitchen that is very well equipped with everything you need if you want to cook, nice lounge area with big TV & good stereo system, they even have a selection of music & movies to choose. There is a room downstairs with ensuite next to the living area, upstairs has 2 rooms one with king size bed & ensuite with lovely outdoor shower, the other room has 2 king singles & can have an adjoining door which was perfect for our two children ages 5 & 7. The 2 upstairs rooms also have a large private balcony with big daybed & nice lounging chairs.There is also another separate room with bathroom across from the pool & very private. Nicely maintained & very clean. Location wise it’s perfectly situated down a lovely little gang, about 7 min walk to bintang supermarket one way & about 3 min walk to seminyak beach, (all down little hidden laneways so avoiding traffic) very easy walk for my husband & kids to go surfing & where I could sit at a warung “Bali Juice Park” & get a nice coffee while relaxing in front of the beach. The other stand out thing at this villa is the staff, they are all so lovely & will go out of their way to help. One day 2 of the staff even took us into Kuta on the back of their scooters so we could pickup some hire bikes. 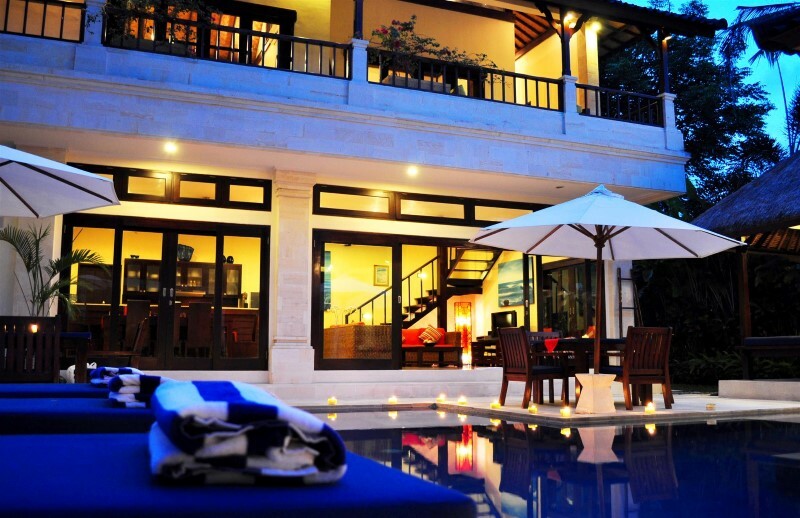 I’ve stayed in many villas over the past 10 years of going to bali & this villa is a stand out as one of the best. I would definetly stay at one of the Bugis villas next time, they are obviously well managed & the staff are fantastic, making our overall stay realy enjoyable. The hard part was saying goodbye. 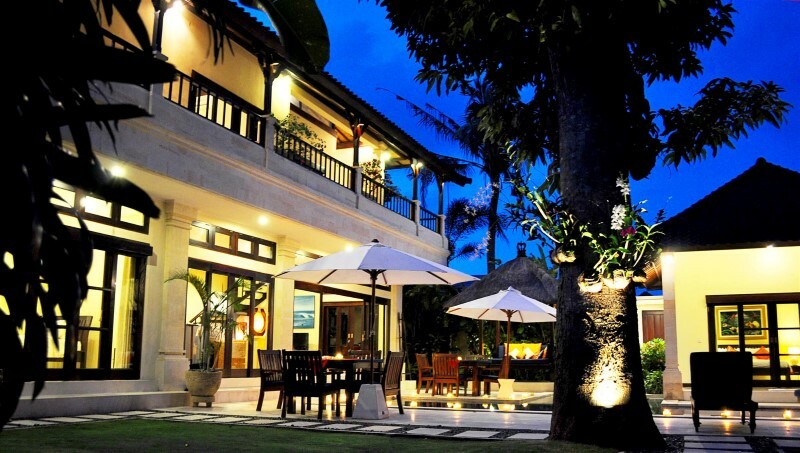 This is my second stay at Villa Bugis (first stay was in Tresna) and I can honestly say I cannot fault either one. 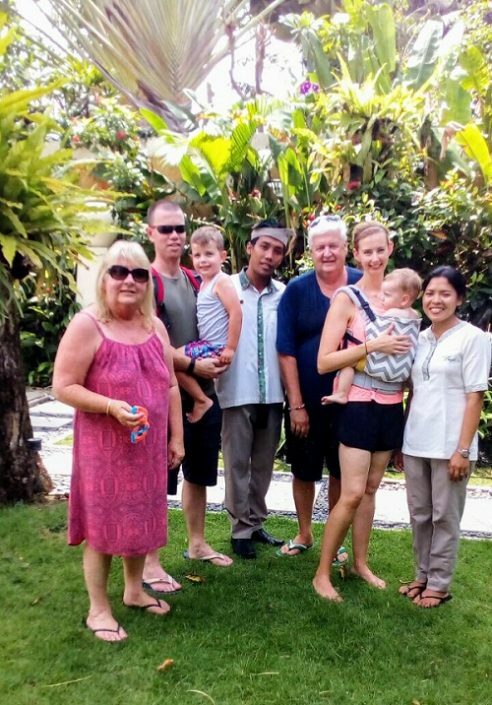 Villa Sayang is well kept and more than comfortable and as for the staff the are more than accommodating, helpful and beautiful people. Even booking was a breeze. I and my travel buddies would like to thank all the staff for an amazing holiday that more than met our expectations and we will definitely be back for more. Special thanks to security for blowing up the Aussie thong to laze in the pool on and I hope your future guests enjoy lazing in the pool on the pool noodles we dragged from Perth ! If only I could click my heels and be back there, already seems like a distant memory. Can’t wait for our next visit !!! It was our first time to Bali. After a very long wait to get through customs, we were greeted at the airport by our driver, Gede. When we arrived at the villa it was pouring rain. We were met at the door of the car with villa staff holding umbrellas and were then quickly ushered inside and offered complimentary cold towels and cocktails (perfect to cool down from the humidity!) while the staff took our luggage to the rooms. The villa was a slice of paradise! It completely exceeded our expectations. The staff were on hand 24/7 and had great local knowledge. Breakfast was included each day (choice of American breakfast, pancakes or Indonesian breakfast) and filtered water was replaced each day. We had the trip of a life time, and would highly recommend Villa Sayang! Visiting Bali is always an adventure combined with fun, cultural, thrill seeking, relaxing and eye opening moments. 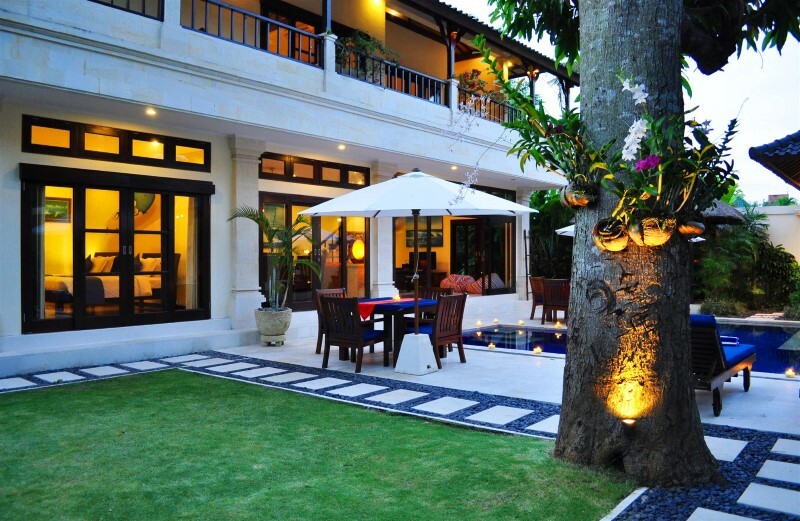 And staying at Villa Sayang, right in the heart of Seminyak, is the best way to compliment your trip. 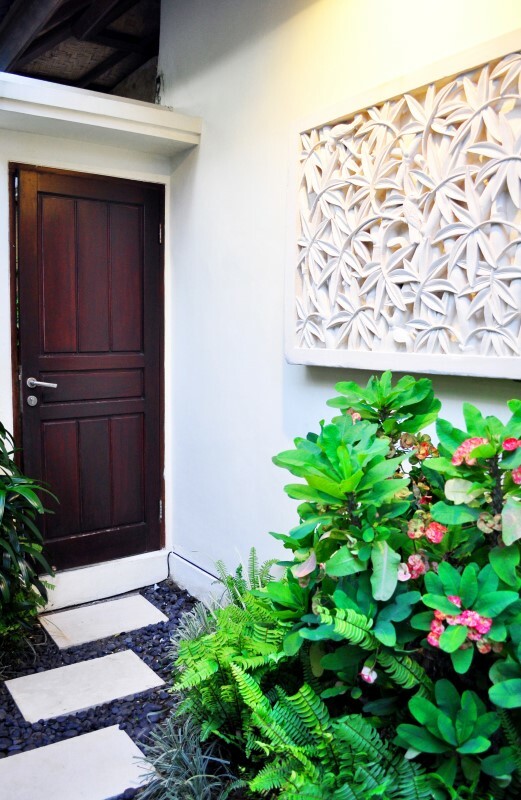 Better described as a tranquil oasis in the heart of Seminyak, Villa Sayang offers you a sense of relaxation, beauty, trust and serenity. 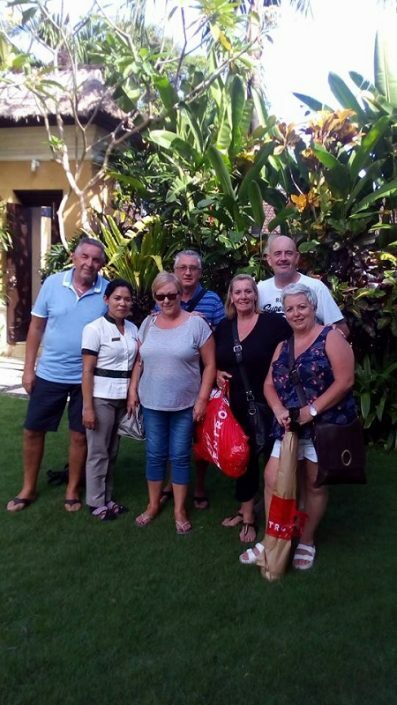 We were picked up at the airport by Putu, a fantastic staff member of Villa Bugis (and yes, that airport can be stressful) and taken straight to the villa in 20 minutes – stress free and easy. 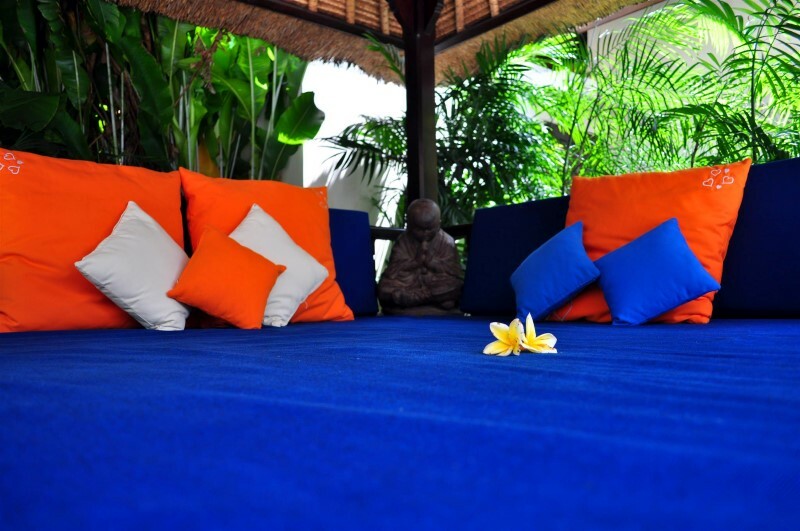 The villa itself is only a short walk from all of the exciting hustle and bustle that Bali has to offer – Double Six, Jl Laksmana, Ku De Ta, and Potato head to name a few, so I can assure you, you will never run out of places to go. 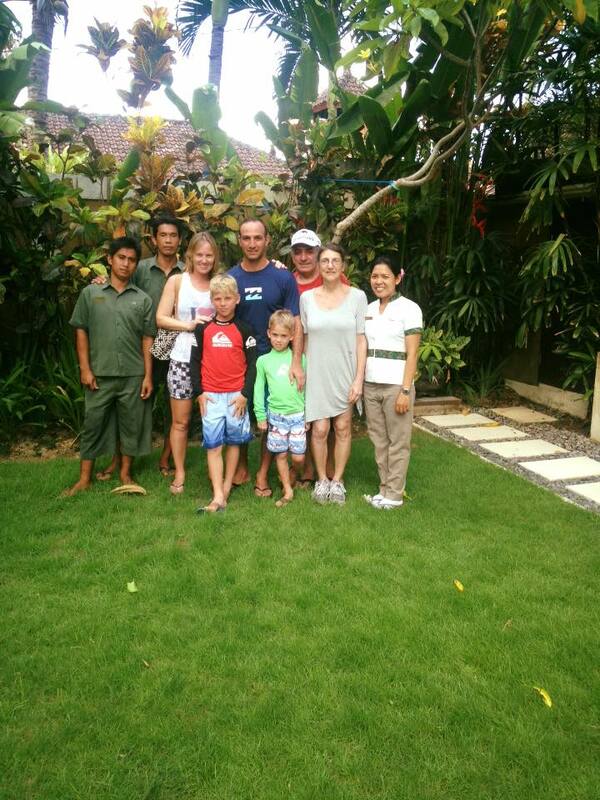 Terimah Kasih Wayang, Anna and the rest of the staff at Villa Sayang, you truly helped make this trip memorable. 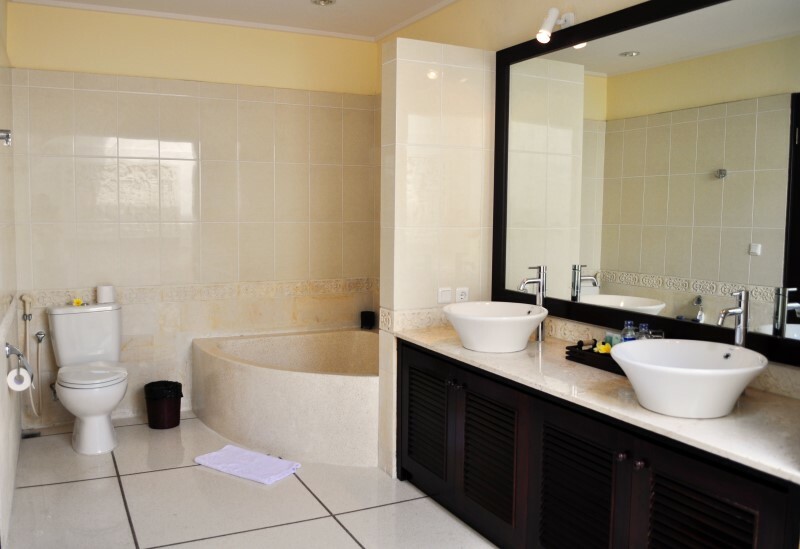 Wonderful villa with four spacious bedrooms and three nice bathrooms, all with showers, two of them with open air showers in addition to the stand alone one by the pool. The space is very communal friendly, centered around the pool. Staff was very accommodating and would get us anything we needed. 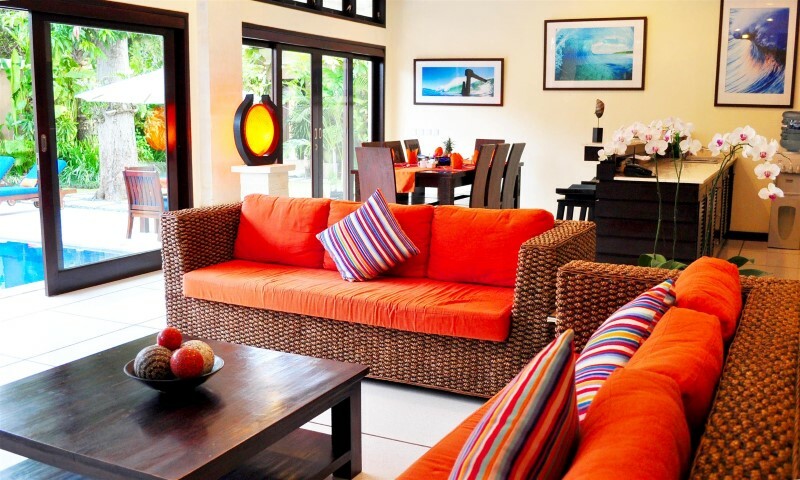 Whenever we would go to the beach (10-15 minute walk) or shopping (5 min), we’d come back to a spotless villa! 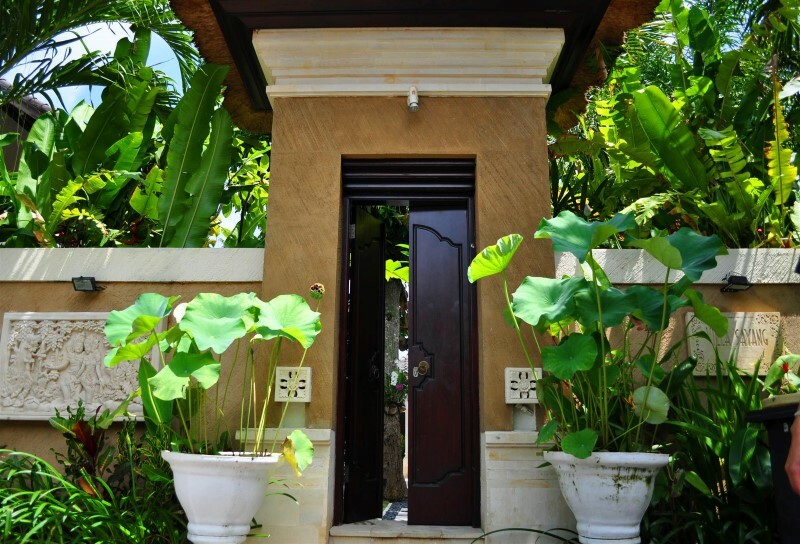 The villa is situated in the perfect place, secluded from the hustle and bustle of the noisy Bali streets but close enough where streets vendors and a convenient store is less than a 5 minute walk away. If you are bold enough, the villa is perfect for those who want to rent mopeds. Just be sure to be careful and wear your helmet! If I ever go back again this would be the place I would want to stay! I highly recommend it! Our villa (Villa Sayang) was a slice of paradise! We had the most amazing 2 weeks and the accommodation far exceeded our expectations. 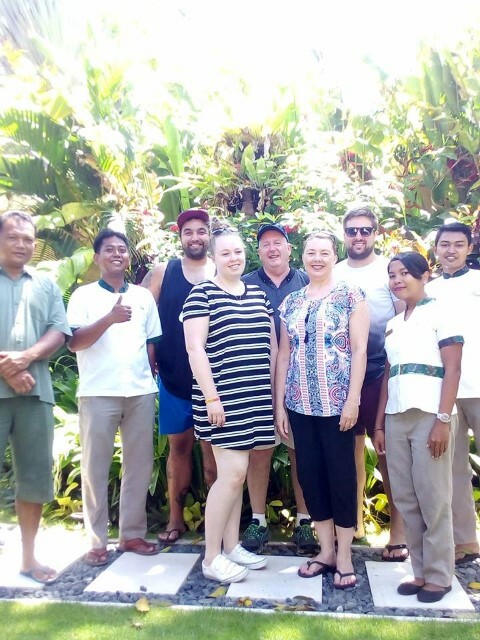 The staff were so friendly and accommodating, and our driver Gede had great local knowledge and got us very competitive deals on many activities (including white water rafting and volcano trek). 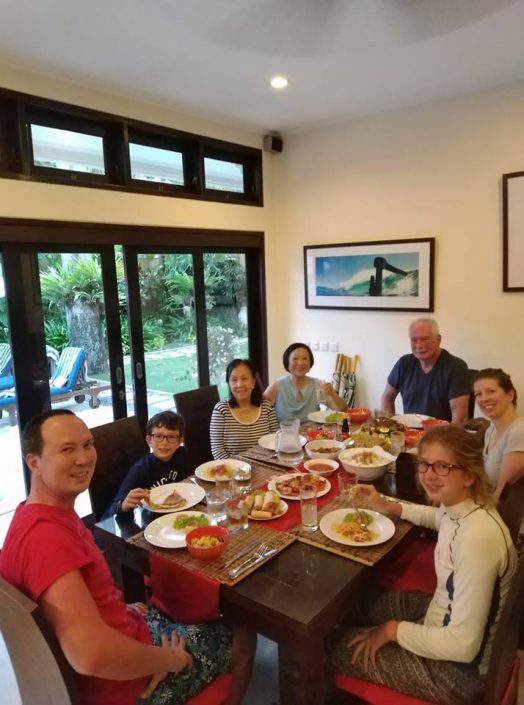 The location is conveniently located within a 5 minute walk to the beach, and 10 minute taxi drive to affordable and authentic Indonesian restaurants (e.g., Biku). The villa was a slice of paradise! The staff were so welcoming and catered to our needs for the entire stay. 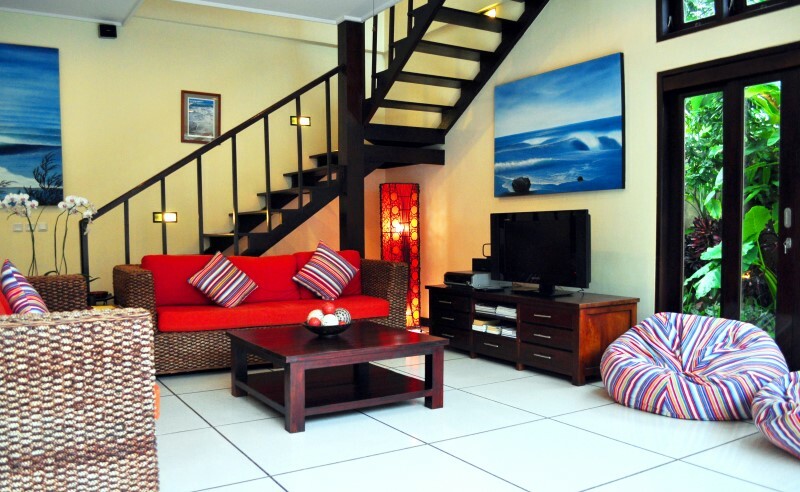 The villa was in the heart of Seminyak, a 5 minute walk to the main supermarket, as well as to the beach. There were so many options for authentic Indonesian within a 10 minute taxi ride and a selection of boutique shops. We had a very relaxing and enjoyable stay, and would definitely recommend this villa to our friends and family! The villa staff were outstanding! 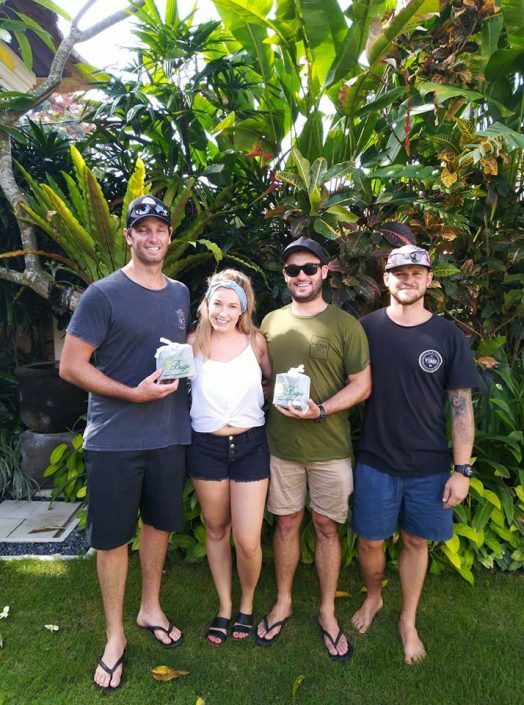 Extremely helpful and generous, they’d go out of their way to help where needed (special mention to our driver Gede – very knowledgeable and provided many laughs). 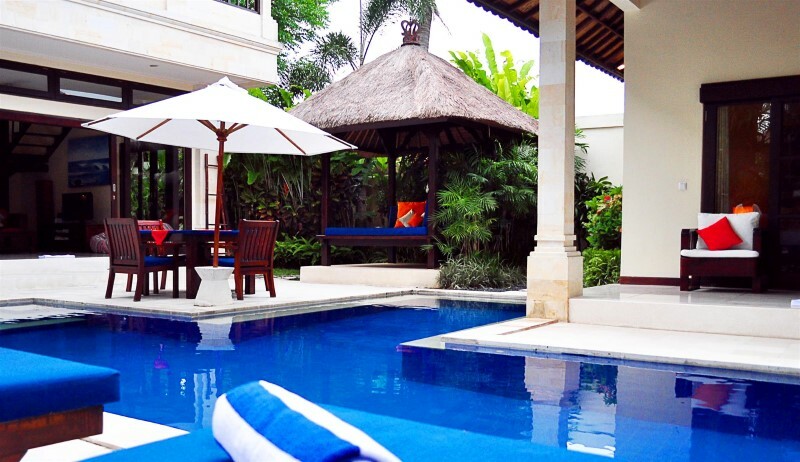 The villa itself is like a little oasis in the soul of Seminyak. 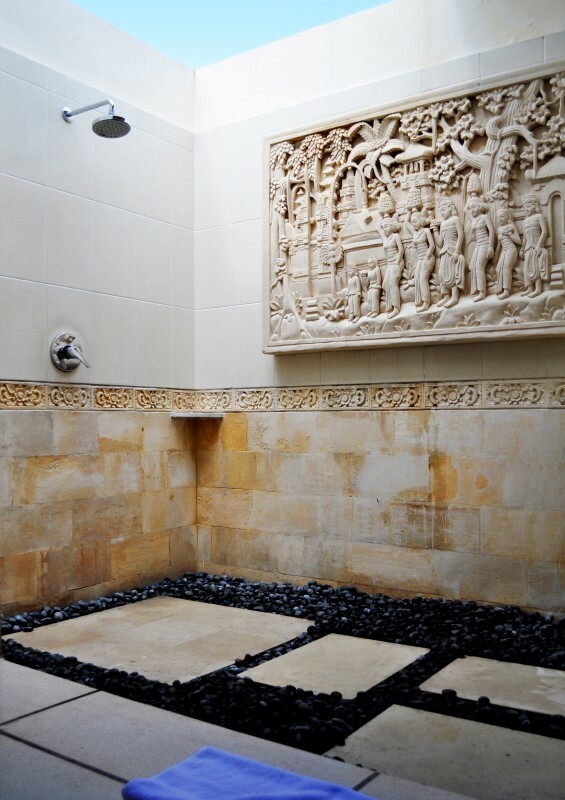 The open plan layout, accompanied with the pool, ensured that the heat never became uncomfortable. A personal highlight was the speakers placed all around the house. Overall I couldn’t recommend Villa Sayang more. It’s the perfect accommodation for any groups young or old! 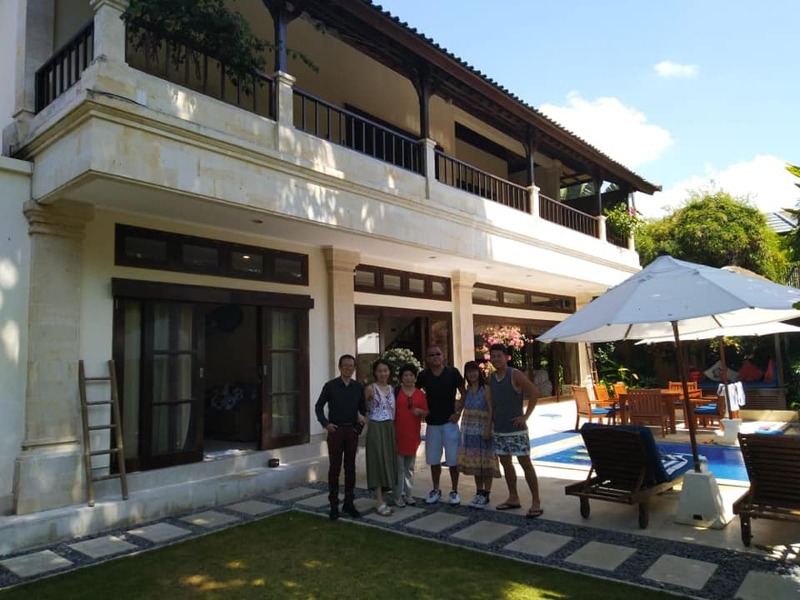 From the very start of the trip, we were picked up at the airport by Villa Bugis’ welcoming staff and happily arrived at Villa Sayang within 20 minutes. 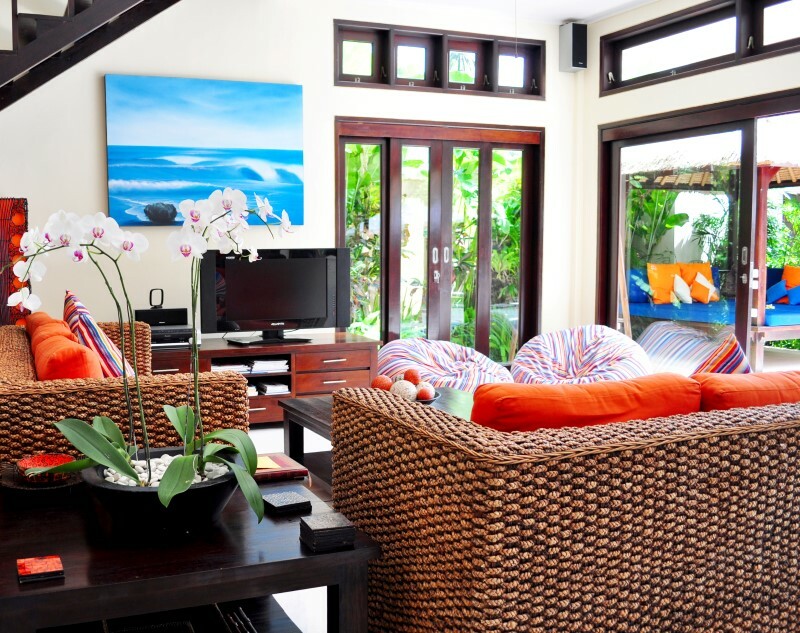 Just a short walk from the popular Double Six beach, convenient stores and local shops, Villa Sayang’s location makes it a perfect homebase for your Bali activities. The 2 story villa was amazing – 4 luxurious bedrooms with air conditioning & flat screen TVs, 3 spacious bathrooms (2 outdoor showers! 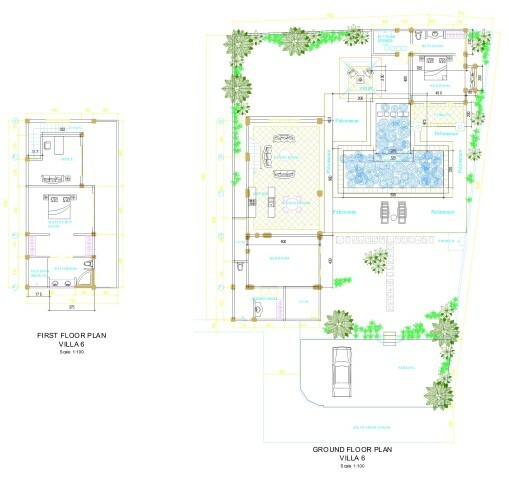 ), your own kitchen, a big living room, a fantastic garden, and private pool. There really wasn’t anything more we could’ve asked for or needed in that case! Villa Sayang was the dream venue for someone like me who was traveling with a big group of friends but could also be perfect for families and couples. The friendly staff made us feel at home and were there everyday to help with advice on places to go, groceries, laundry, transportation, & general housekeeping. I really can’t thank the staff enough for everything they did and provided for! 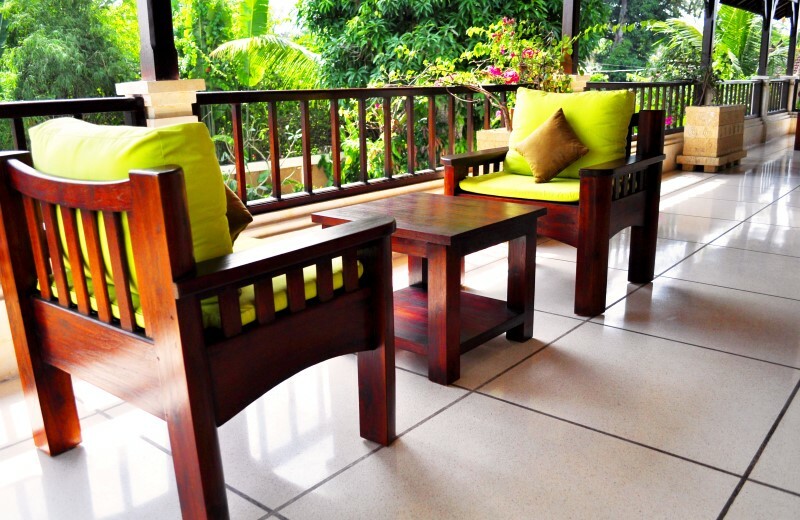 I would definitely love to come back to Villa Sayang on my next visit – I miss the place already! Villa Sayang is an absolutely gorgeous villa, even more so than the photos that I looked at. The living/dining/kitchen has bi-folding doors should you want to close this area off to watch a movie or of an evening when the mossies settle in. 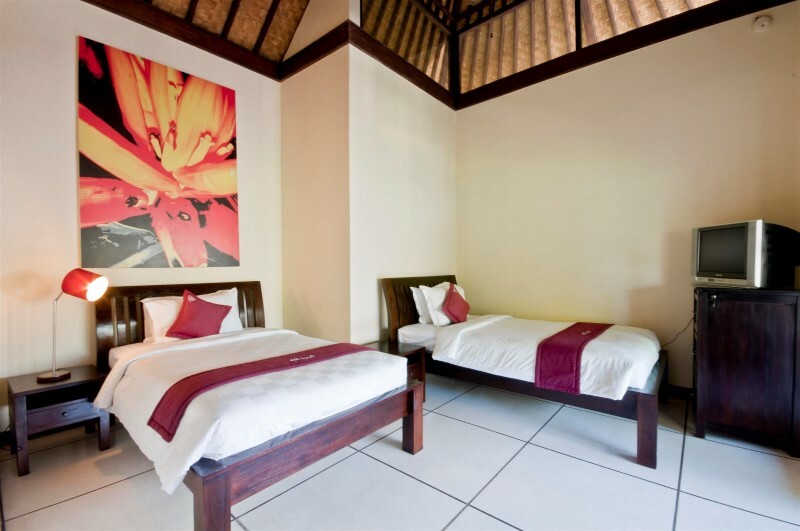 The 2 bedrooms downstairs (one opposite the main house) have king size beds with their own ensuite. Upstairs there is a bedroom with king size bed and its own ensuite on one side of the room and then on the other there is a room with 2 king singles, which would be great if you had smaller children. All rooms have aircon and their own tv. The only thing we found the villa didn’t have was an ipod dock, which was a very minor detail. The staff were lovely and very discreet. We had a choice for breakfast each morning so it was nice to mix it up between western food and balinese in the mornings. The location is perfect, between the beach and Bintang Supermarket and with security right out the front of the villa it felt very safe. I would not hesitate in booking Villa Sayang again. 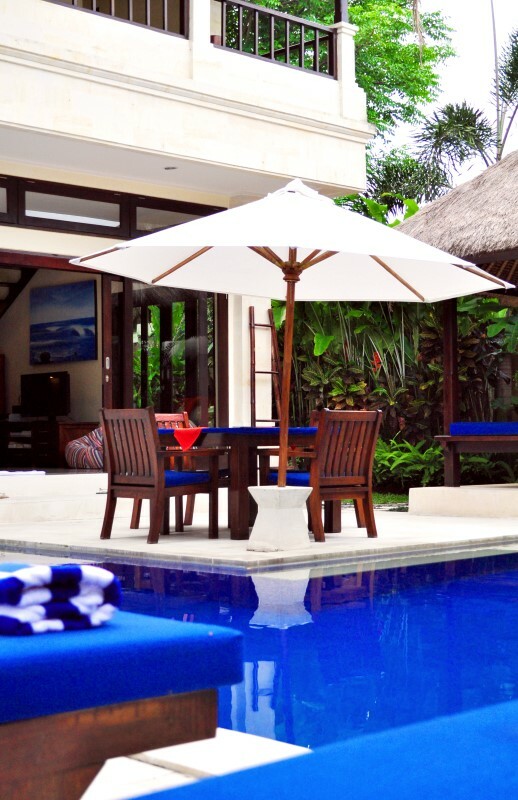 We have just had a fantastic stay at Villa Sayang, the perfect spot for everything you want to do on a break in Bali. It’s tucked away from the hustle and bustle, just a short amble down a friendly lane onto the beach for a swim, afternoon drinks and sunset. Villa Sayang is central to everything- walk to restaurant and shopping precincts in every direction, or a short taxi ride for further afield. Or simply relax poolside in the gorgeous private garden- just like the photos! The villa staff tried to assist us with requests when needed. They were friendly and helpful from the moment we were picked up from the airport until they farewelled us from the garden gates and we were dropped back at the airport. Villa Sayang was our best choice for a getaway in Bali- location, ambience, friendly staff, and great weather at this time of the year, too. Wanna go again soon! Location, location, location. 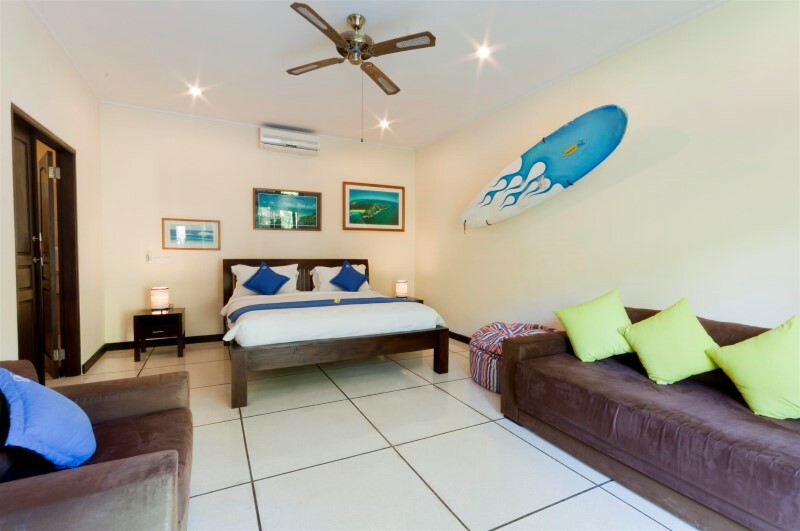 One block from the beach, directly inline with La Plancha bean bag beach bar and beautiful Gado Gado Restaurant to the right. Around the corner from some fun night clubs and only a five minute taxi ride from eat street Seminyak. 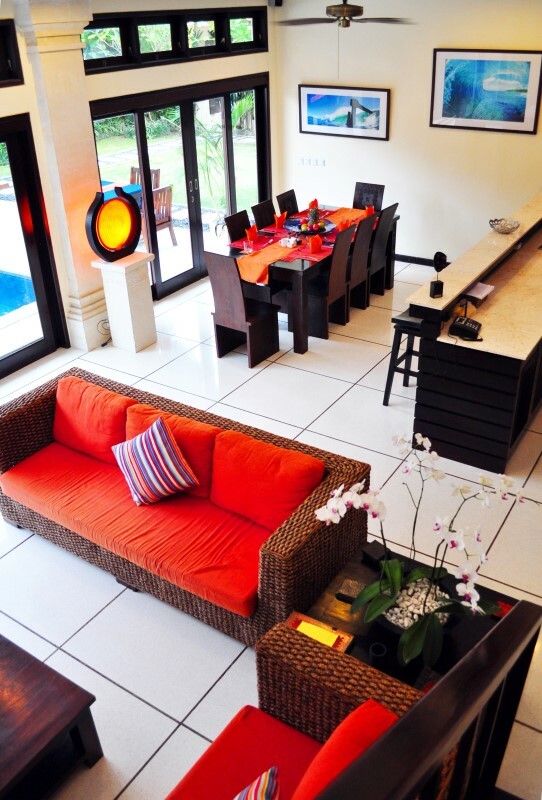 The Villa is quiet, spacious, gorgeous pool and well maintained. Staff were very helpful and also disappeared when you wanted privacy. I’ll definitely be back. Stayed in villa sayang in november 2011, was absolutely amazing, will be back soon, and sure to be staying in another one of villa bugis’s villas. Great family holiday. Staff were fantastic and the villa was beautiful and spacious.